High school football player Spencer James catches the pass for a touchdown to win the game. Immediately after, shots ring out from a drive by. 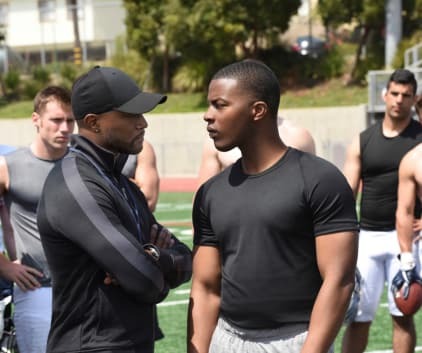 Spencer is approached by a coach from a better and safer school in Beverly Hills. He wants Spencer to come play for him. Spencer turns him down, but Billy goes to his mom. She doesn't want him to turn down such a good opportunity. He accepts the offer. Spencer meets the coach's kids and the rest of the team, including the jerk Asher who also plays wide receiver. Coach Baker asks Spencer to play safety on the first day. Coach Baker's job could be on the line if they don't start winning games. He's using Spencer to do that. Olivia admits to Spencer that she's the social pariah after a stint in rehab. Spencer gets invited to his first party and the team lies to him. They get him drunk before the next day's practice to make him look bad. Billy admits he needs Spencer to win games, but he still convinces him that staying is what's best for him too. Spencer's friend Coop helps him realize he should stay. He agrees to play whatever position Coach wants him to play. He starts out as safety, but he spots an injured player, and Coach puts him in for Asher on offense. He makes a big block that results in his team scoring. Another school is questioning Spencer's recruitment as breaking rules thanks to Jordan. The only way for Spencer to stay is to move to Beverly Hills and live with Billy and his family, so he agrees to move in with them.